Today I will take about Krups Essenza XN2140 or XN214010, it is also known as Nespresso Essenza C91, C99 and C100 in North America. It is a Nespresso coffee machine, which means that you need to use Nespresso coffee capsules, not ground coffee, not coffee beans. That model is produced for more than five years, but several years ago Krups made some simplifications. For example there no switch on/switch off button now, it was on previous generation of that model. There is only a placeholder for the button. So you need to switch on the machine by simply pressing of the two button on front panel. That and other simplifications allowed Krups to make Essenza model even more affordable. And now it is on of the cheapest original Nespresso coffee machine on the market. In some countries, mainly in Europe (e.g. France, Spain, Germany), it the cheapest Nespresso coffee maker now. Krups XN2140 even has some premium functions. Like metal coating for example. Colored side parts and lever are made of metal. I’m not sure that if it is stainless steel, it looks more like some aluminium alloy. However, semi metal body for that price – that’s super good! Machine construction is the same as on any other Nespresso coffee maker by Delonghi, Krups or Breville. That’s how Nespresso gurantees that taste of the coffee would be the same on any device. We have a water tank on the back. Its capacity is 0.9l. It’s quite easy to use, it has a special ring for a finger, which makes it easier to take it out. The only problem that you should take it out to add water. Compared to other Nespresso models, where you can pour water directly into the tank without taking it out. However that’s not a big problem, just a matter of habit. After tank we have a pump. On Krups Essenza it’s located on the bottom and its maximum pressure is 19 bars. It doesn’t mean that XN2140 is better than other Nespresso models with 15-bar pumps. 15 and 19 bars designates maximum pressure on the exit of the pump. 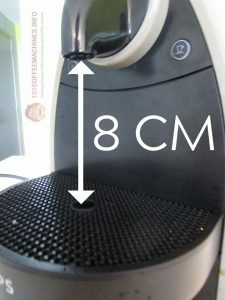 The real pressure inside the capsule, which is needed for good espresso, is 6-8 bars. So in both cases it is more than enough. After pump we have a thermoblock. It’s heating element and it’s quick. When you switch Krups XN214010, the lights on the buttons start blinking, that means that thermoblcok is on and heating the water. After 10-15 second coffee machine will be warm enough and lights will stop blinking. 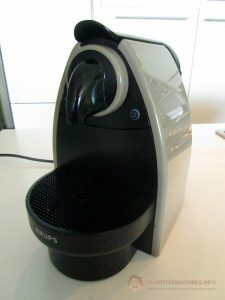 The maximum cup height is the only serious problem of Krups XN2140/Nespresso C91 coffee machine. After thermoblock water goes through capsule to coffee dispencer. And under it we see a cup stand, which is combined with drip tray and reservoir for used capsules. Its capacity is about 14 used capsules, so after 14 caps of coffee you should empty it. It’s very easy to do it. And here we have probably the biggest problem of that model. The maximum cup height on Krups Essenza is just 8 cm. That’s beacuse the pump is located on the bottom, that’s why the cup stand is so high. If you remove the cup stand it could help a little, but not much. You will gain one extra centimeter of height maximum. So that could be a problem if you like to drink coffee in high glases. On the front panel there are two buttons. They are only for black coffee, there is no any milk function like milk frothing for cappuccino on this coffee machine. Default factory settings are 40ml and 110ml respectively. However you can easily change that settings. Press the button and keep it pressed, machine will start to makinf a coffee. When there is desirable amount of coffee in the cup, unpress the button. Krups Essenza will stop and will remember that adjustment in future. So next time you will need to make just one touch as usual to make coffee of the same size. 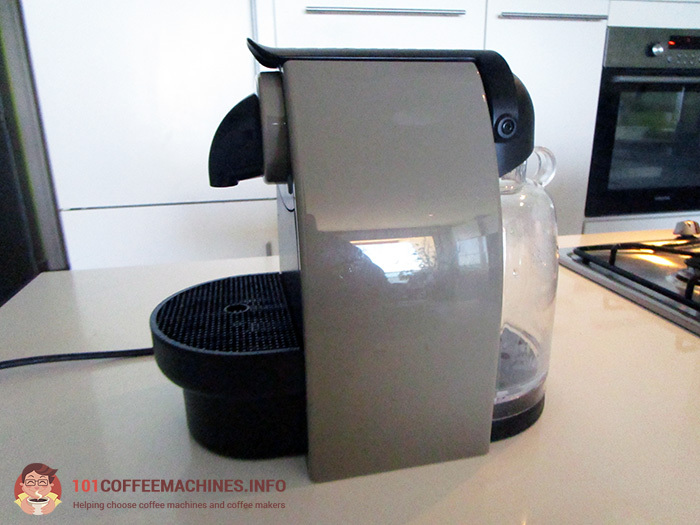 You can program machine to make extra big cups of coffee, like 200ml or even more. However I don’t recommend to do it because the taste would poor, bitter due to overextraction. The reason is there is to much pressure for classical american coffee (caffe americano) on that machine. If you would like to do so called ‘americano’ (big cup of not strong coffee) you better use scandinavian method – add espresso on top of the hot water. In that case the coffee would not be overextracted and it would have beatiful crema on top, like on real espresso. I show how to do it in my Krups Xn2140 video review, at the end. Nespresso Essenza C91 (sometimes sold as C99 or C100) is the same model, it is sold in US and have words ‘Nespresso’ instead of ‘Krups’ on the body. It is sold only in black or silver colors, while original XN2140 could be brown or black. All else being equal. Let’s summarize key facts about Krups XN2140 Essenza. The same is right for Nespresso C91. Buying XN2140 is reasonable choice if your family drinks one, two or maximum three cups of coffee per day. In other case you probably should buy aitomatic beans-to-cupo machine, which uses coffee beans. It costs more, but you will save the price difference on coffee. 2. It’s designed for black coffee. There is no automatic functions for cappucino or latte. The Krups Essenza suits you if you mainly drink black coffee. 3. The low price doesn’t affect the quality. The basic functionality is the same as on any Nespresso machine and the taste of the coffee would be the same. Essenza xn214010 even has some premium futures like side panels made of metal. The metal also helps to reduce the noise from the pump, so that model is little quieter than its “plastic” counterparts. Don’t forget to descale this machine. You should run descaling cycle every 6 months, the proccess is described in the manual (you can download it in English below). If you will do so the machine will work for you for years. In other case, scale could damage the pump. « Delonghi ECP 31.21, 33.21, 35.31 review. The right balance of the price, the metal body and the quality + unique milk foam regulator. Sorry, no ideas. Except one – if there is at least a little shift, you can try to reach the capsule from the bottom. I mean you can try to remove the used capsules container and to look upon it, through the hole where capsule falls after being used.